in the column A. By using an array formula I want to do this to all the rows in the sheet but it does'nt work simply by making the above as an array formula. How can i make the above an array formula or is there any other way. The array formula should be in A1 cell. COUNTIF produces a count, but here it is just being used as a true/false test. Excel treats a result of zero as false and any positive number 1 or greater as true. If it is greater than 0, then the column A value is y. If not, leave it empty. The * is a wildcard, meaning any data in the cell will include the cell in the count. Since Row 1 has data in B1, C1, and D1, the value in cell A1 will be y. The same for the single value in row 12. Row 3 is blank because there is no data from B3 to Z3. Not the answer you're looking for? Browse other questions tagged microsoft-excel microsoft-excel-2010 worksheet-function google-spreadsheets or ask your own question. 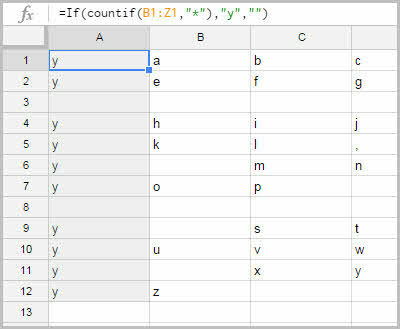 How do I count # of rows in an array ONLY IF the sum of numbers for each row is >0 in Excel? How to automatically delete blank row/cells when export to other worksheet?